Like AEON Retail Malaysia FB fan page. Fill up the form to update your personal info. 100 AEON points will credited into your AEON member account 2 months after the contest ends. The lucky winner will contacted from 22nd to 26th of April 2013. Potential winner will only need to answer a simple question in order to win the prize. Results of the actual winners will be announced through Facebook on 8th of May 2013. 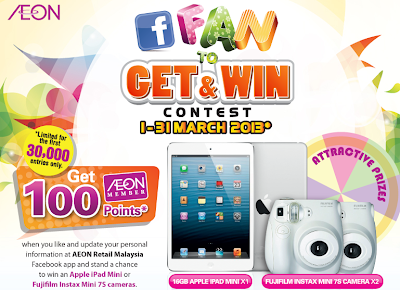 Visit AEON Retail Malaysia FB fanpage for more details.